An extension at a fraction of the cost. Solid roof extensions or “imitation tiled” roof extensions are the latest fantastic product innovation that is sweeping the market. Our system of choice for our solid roof extensions is the Guardian warm roof system, which are market leaders in thermal and value for money terms. Available with Tapco and Metrotile tiles in a choice of colours and skylights within the roof, many customers are now choosing to pay the extra for the complete extension look and feel. We can fit our solid roofs onto a traditional conservatory, a brick-built orangery or a Loggia depending on design preferences and budget. Can be carried out either as a roof replacement or as part of a complete job. Sometimes, our customers want to keep the base, windows and doors in the structure but just want to change the roof. Alternatively, we build the base, windows, doors and solid roof from scratch as a normal conservatory, orangery or Loggia would be built. Are designed with our customers from start to finish. From the initial appointment to the showroom appointment to firm up design, onto the planning and building regulations process and site survey to take final measurements and design right through to the final installation. Are fantastically thermally efficient, with the thermal values of the brickwork or Loggia columns underneath, the Guardian warm roof system complements this to create a fantastically energy-efficient space. Come as a complete package. We carry out all the building, plastering, electrical, lighting and plumbing work as well as installing the roof itself, along with the windows and doors underneath. Are available in the same designs as any of our conservatories or orangeries, with lean-to, Edwardian, Victorian, gable-ended, P-shaped and bespoke designs all available to suit any property and budget. Come with two tile types. Metrotile and Tapco. Both are on show at our showroom. Are available with skylights built into the roof. Many of the solid roofs we install are simply roof changes onto existing windows and doors in a conservatory. 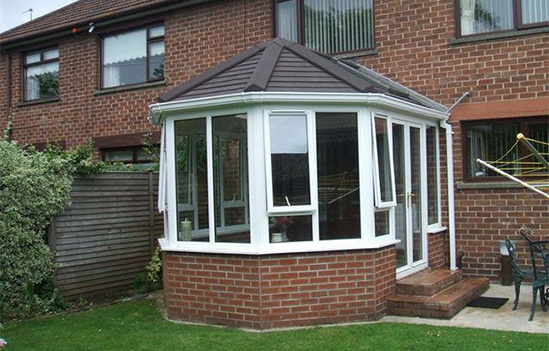 Our Solid Roofs are designed to go down on the most basic conservatory structure. It doesn’t need anything more than standard reinforcement to hold up the weight of the roof above. Even with a standard conservatory design, with no brick corners or Loggia columns, a solid roof totally transforms the feel of the room into a solid roof extension with a fantastic panoramic view with its glazed walls. We have a fully-size solid roof conservatory at our showroom in Kent. Orangeries are, in many ways, an extension with a glazed lantern in the flat roof. Choosing a totally solid roof for an orangery truly makes the structure an fully-fledged extension, with a fully plastered ceiling and skylights to allow additional light in. Whether our customers choose a flat roof with a lantern or a solid tiled roof on their orangery does purely depend on what the room is going to be used for. We are, as always, more than happy to advise on appropriateness and cost for every option. We have invested a lot into developing our showroom so we have everything on show. 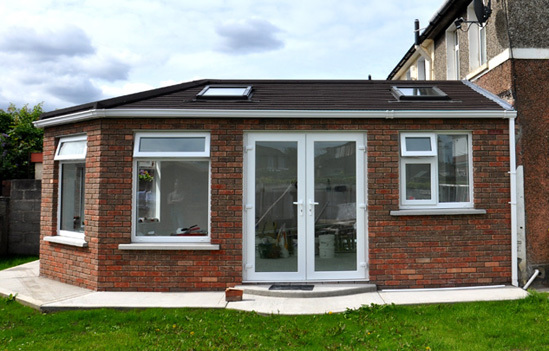 This includes a fully sized solid roof conservatory. What’s more, we have split the roof in two, with one side showing Metrotile tiles and the other side showing Tapco tiles, to truly exhibit the options. When making such substantial investments in our homes, as solid roof extensions inevitably are, we think it’s only right to see exactly what you’re going to get before ordering.